BeatWoven interprets sound and music into pixelated patterns and designs that can be woven into fabrics by automated looms. Building upon their existing business this partnership with Dr Noam Shemtov and Andrew Robertson, of Queen Mary University London, sought to predict and overcome the legal and technological obstacles that would occur due to the company’s recent successes. Preempting these challenges the collaboration aimed to ensure BeatWoven had a commercial concept to take forward. With the help of Queen Mary’s Centre of Digital Music BeatWoven was about to develop their existing software creating a new and improved platform with evolved features and the potential for app developments. Dr Shemtov from the legal department advised Ricketts on issues such as copyright, additionally he authored a conference paper and academic article. 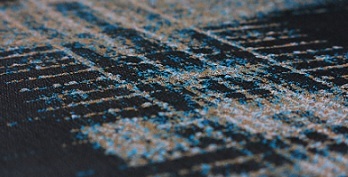 Subsequent to the collaboration BeatWoven has received numerous collaboration offers, including a commission from The Southbank Centre and the London Philharmonic to translate the theme music from Brief Encounters and work with Harrods on an exclusive collection for London Design Week 2014. Ricketts has also worked with Future Heritage for the Decorex International 2014 and has received interest from Martin Kemp Luxury Design and Converse.